Newly-launched Dogma FS will be ridden by Team Sky at Paris Roubaix this Sunday and features fully integrated electronic front and rear suspension. Pinarello have unveiled their new road machine ahead of the Queen of the Classics, the Dogma FS will make its race debut at Sunday’s Paris Roubaix. The idea behind this revolutionary bike is to maintain the signature handling and racing performance of a Pinarello Dogma over rough terrain – i.e. the cobbles of northern France. 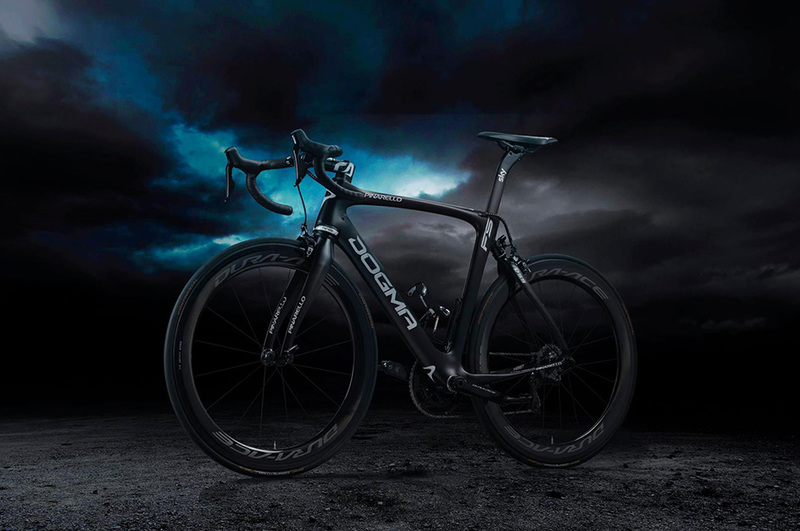 Designed in collaboration with the pro riders from Team Sky and electronic suspension company Hi-Ride, the Dogma FS is made from the same Torayca T1100 carbon as the F10 but with the added Dogma Smart Adaptive System. The DSAS is designed to be fully adjustable depending on the terrain the bike is being ridden over. The fork has been completely redesigned to integrate the electronic front suspension with 20mm travel. The electro-hydraulic dampener in the rear of the bike allows up to 11mm of vertical travel and can be customised based on rider preferences. The Dogma FS follows in the footsteps of the Dogma K10-S, which, when launched a year ago, featured the eDSS 2.0 (Electronic Dogma Suspension System) as a form of rear suspension. The new DSAS is the world’s first electronic front and rear suspension system to be deployed on a road bike. The Dogma FS frame can accommodate up to 28mm tyres, the width likely be employed by Team Sky over the gruelling terrain of the northern France.